Forex trades are almost entirely margined -- in effect; the broker gives you the opportunity to make trades with money you don't have. The average leverage on the forex is very high -- between 50:1 and 200:1. Leveraging an account to the maximum 200:1 ratio means that even the slightest drop in the value of your ​active trades can wipe you out. That's when you get a margin call from the broker. If you want to continue trading, you'll have to put more money in your forex account. So the simplest answer to the question "What is a margin call" is that it's a demand from your broker to put more money in your account if you want to continue to trade. 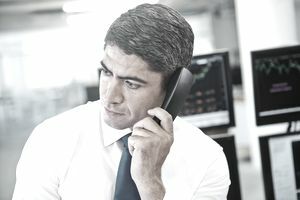 In a 2014 article in DailyFX, a well-known online forex market newsletter, trading instructor Tyler Yell identifies the trading behaviors that produce margin calls in a nutshell: "the use of excessive leverage with inadequate capital while holding on to losing trades for too long when they should have been cut."